Though there are a number of these resources around the country, I like the following two options the best. Most of these programs offer four to eight days of intensive counseling for marriages that need support, healing, love, rest, and major changes within the spousal interactions. The good ones provide quality on-site housing, outstanding meals, wonderful environments, and multiple credentialed therapists. The top programs also have ongoing outcome studies to document their effectiveness. Be aware of discount programs. The quality and costs of these two programs, their outcome studies, and their Christian orientation set the benchmark from which to evaluate other options. 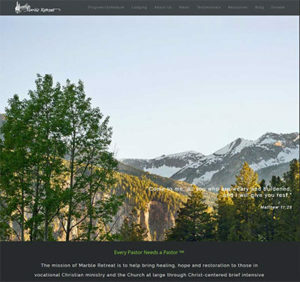 Just outside of Aspen, Colorado, in the Crystal River Valley, lies Marble Retreat at 8,000 feet. This eight-day program was started forty years ago by Dr. and Mrs. Louis McBurney and is currently staffed by Drs. Kari and Michael MacKenzie and Dr. Lisa and Bob Rue. Marble Retreat has had a long and fruitful history with over 4,000 vocational Christian alumni from multiple denominations. 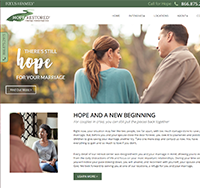 Recently Marble has made its services available to the entire Christian population, both married and single..
Focus on the Family’s Hope Restored intensives offer marriage counseling for couples who are facing an extreme crisis in their marriage, and who may even feel they are headed for divorce. In the care of expert professional counselors, you are given the chance to escape from the daily distractions of life and focus on your marriage. Our beautiful and relaxing retreat centers in Missouri, Georgia, or Michigan will provide a place of emotional safety that will allow you to receive help, healing, and restoration. Both of the above programs use the same marital therapy model (developed by the Mayo Clinic), utilize two therapists with the group, and charge almost identical fees. The one major difference is that, given the longer stay, Marble is able to offer each spouse individual therapy as well. Both programs fit well in an infidelity recovery process. A third option, consisting of a weekend experience and six to twelve follow-up sessions, is the Retrouvaille Program. 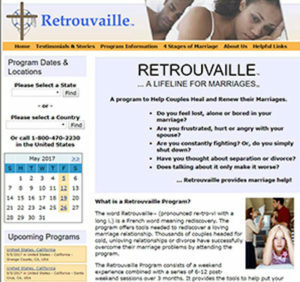 This is the best volunteer self-help, brief intervention program available, and designed for marriages close to divorce.